Engraved walrus tusk depicting polar bears attacking walrus, dating from the 1940s in Chukotka (Magadan Regional Museum). In the Early Medieval period, when supplies of elephant ivory reaching Europe reduced or ceased after the Muslim conquests, walrus ivory began to be traded by Vikings into northern Europe as a replacement. King Alfred the Great of Wessex records that he was presented with walrus tusks by the Viking trader Ohthere of Hålogaland in about 890, which may mark the start of this trade. 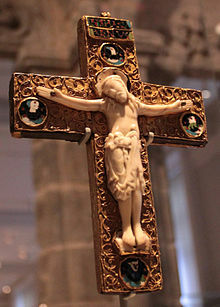 Nearly all ivories in Anglo-Saxon art use walrus, and most northern European ivories of the 11th and 12th centuries. 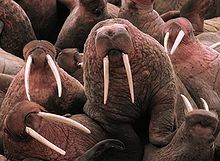 Initially large walrus herds were found much further south than is the case today, and it is likely that their hunting for ivory greatly impacted on populations. Around 1160 northern European ivory carving was greatly reduced, which may well be because the material was less easily available. Around 1260, at the start of the Gothic period, elephant ivory began to reach Europe again, and the industry greatly increased. The Norse also carved items in walrus ivory, notably the Lewis chessmen. ^ Williamson, 9, an archaic term for the animal, but which survived much longer as a term for the ivory, though it too is now old-fashioned. Wikimedia Commons has media related to Walrus ivory. Smithsonian Cooper-Hewitt, National Design Museum. "Pipe #1926-37-61". Smithsonian Cooper-Hewitt, National Design Museum. Retrieved 10 October 2012.